The Oregon Ducks defense last season was very inconsistent, both dominating opponents and being dominated by opponents. The most obvious example is the juxtaposition between Oregon’s destruction of Jameis Winston and FSU and their own destruction at the hands of Ohio State. 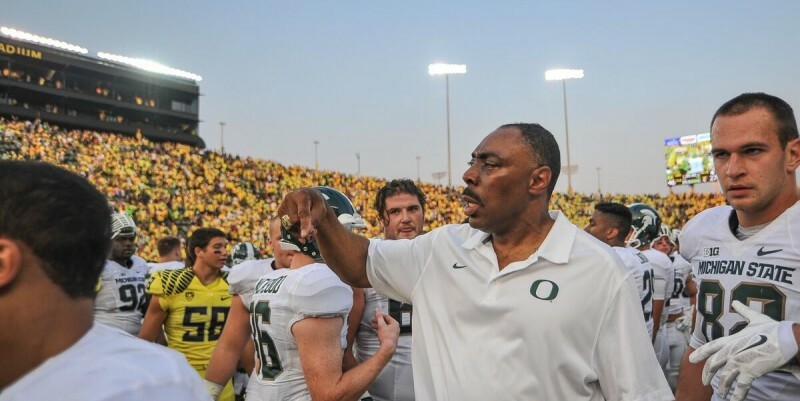 While the defense didn’t always play up to their potential, they did pretty well most of the year, especially considering it was Don Pellum’s first year as defensive coordinator for the Ducks. Now going into his second year, Pellum is faced with the task of improving an inconsistent defense that also lost multiple important players to the NFL Draft. Second year DC Don Pellum will look to get the defense to take a huge step forward. 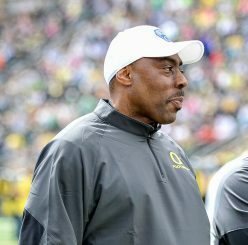 A lot of defensive coaches might look to add different things to suit new personnel, or even to overhaul their defensive scheme entirely, were they running the show at Oregon. 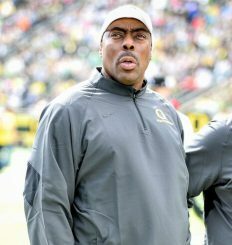 In an article by Chantel Jennings of ESPN, Pellum mentioned how Oregon is going in an opposite direction, “… we’ll be more specific … [if] we’re playing a certain team and they’re running a certain play, last year we might’ve had two or three or four different things we could do. [This year] we’re going to dial it down to one or two and be really, really good at them.” Rather than changing up the entire playbook to cover up weaknesses, Pellum is going to simplify and streamline the defense to keep everyone on the same page. Buckner looks to be one of the core veteran players for Pellum. As Chantel Jennings points out in her article, despite losing impact players such as Erick Dargan, Ifo Ekpre-Olomu, and Arik Armstead (to name a few), Pellum actually feels that he has more veterans going into this season than he did last season. 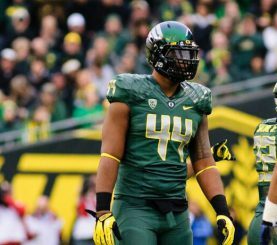 Jennings rattled off a list of players who Pellum considers veterans, including “… defensive lineman Alex Balducci … experienced linebackers in Joe Walker, Rodney Hardrick and Tyson Coleman … cornerback Chris Seisay … and safety Reggie Daniels [who] finished third on the team in tackles.” Along with these players, the Ducks will also return stud lineman De’Forrest Buckner. With a core of veteran players to go along with a team full of young talent, Pellum is priming his defense to take a huge step forward by streamlining and specializing his defense for particular opponents. Pellum has said that, because of going through a first season with a new DC, they can now afford to have fewer plays for every situation, as they know how a lot of teams are going to attack them. Essentially, the Ducks will be able to tailor the defense to specific opponents, going with fewer options that make the most sense against each team. This specialization from week to week, paired with an overall thinning out of the playbook, will allow Pellum to have his defense playing faster while also cutting down on mistakes. Along with streamlining the defense, Pellum is also looking to put the team into position to disrupt the opponents’ passing game via a stronger pass rush. While Oregon did use four rushers some of the time, there were many instances last season where they relied solely on three down lineman to rush the passer. This season, Pellum will mix things up a little more. In an interview with Andrew Greif of OregonLive, Pellum said, “I think we can create some better pass-rush situations, to where we can utilize our speed a little better in certain situations.” The key here will be the utilization of speed rush players to get after the QB. The changes Pellum is making to the defense could allow the Oregon defense to finally catch up to their offense. The focus on utilizing speed and streamlining the defense mirrors what Oregon’s offense has been doing for years — for good reason too, as a “Warp Speed” defense will help Oregon greatly against other up-tempo spread offense teams. If Pellum really wanted to combat opposing up-tempo offenses he could even go to using the same simple plays out of a lot of different alignments and looks on defense — it would keep the scheme simple but make it appear complex, just like the Oregon spread offense. Despite losing many key players, and having very few household names left on the defensive side of the ball, Pellum’s second year as Oregon’s DC could very well be a huge step forward for Oregon’s defense. With a shift to a simplified scheme focused on getting speed players in position to wreak havoc on opponents, this season could be one for the ages. We may be witnessing the next evolution of defense, stepping up to match the monster that Oregon has created with the Warp Speed Zone Read offense.